PowerShell.org > Articles > PowerScripting Podcast > Giveaway and Discount Offer for Don Jonesâ€™ New PowerShell Book! 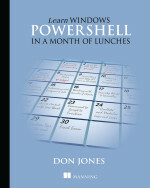 As you might have heard, longtime author, speaker, trainer, and PowerShell MVP Don Jones is working on a new book project titled â€œLearn Windows PowerShell in a Month of Lunchesâ€. The concept is a book to help the non-programmers out there to learn PowerShell in bite-sized chunks. It isnâ€™t due to be released until Summer of 2011, however, if you are in Manningâ€™s Early Access Program (MEAP), then you can take a look at the chapters as they are completed, and even give feedback to Don as he writes. How does one attain membership in this elite class? All you have to do is pre-order the book (ebook or print edition), and you get immediate access. The full price for the ebook edition is $34.99, and the print edition is $44.99.